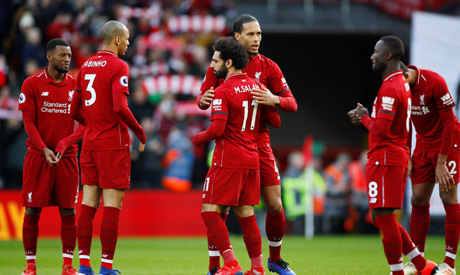 The win, secured with goals from Sadio Mane, Georginio Wijnaldum and Mohamed Salah, moves Juergen Klopp's side three points above second-placed Manchester City who face Chelsea on Sunday and would return to the top on goal difference with a victory. After consecutive draws, the pressure was on Liverpool to dispel any talk of them lacking the steel for a tight title run-in and after surviving a scare when keeper Alisson Becker had to parry a Ryan Fraser shot in the second minute, Klopp's side looked close to their best again. "We have high expectations and today we won in an impressive manner - we had some outstanding performances on the pitch," said Klopp. "We wanted to show a reaction. It's our job not only to come through but to really perform and convince," he said. Mane opened the scoring in the 24th minute with a well-placed header from a James Milner cross - the Senegalese forward's fourth straight league match with a goal. Ten minutes later, Wijnaldum, whose return to the midfield after injury made a noticeable difference, doubled the lead with a gloriously executed lob over Artur Boruc after collecting a lofted pass from Andy Robertson. Three minutes after the interval, Salah, who had wasted two good opportunities in the first half, made no mistake after being played in by a clever back-heel from Roberto Firmino. The pair combined again in the 76th minute, this time Salah hitting the bar with a well-struck left-foot effort. Yet as the Kop sang "we shall not be moved" at the final whistle, it was clear that this was a much-needed victory and performance for Liverpool. "Some of the play was mesmerising. We could have scored more," said captain Milner. "It's been a tough few weeks with players injured and ill. Georginio Wijnaldum was nowhere to be seen yesterday and then he produces a performance like that." The loss was Bournemouth's eighth consecutive away defeat, their worst run of form on the road for 35 years. Only bottom side Huddersfield and second bottom Fulham have conceded more than the 47 goals Eddie Howe's side have let in this season.